For those out there who love looking at organization (and I'm one of those! ), here are the pictures of my ribbon jars that I promised. I was going to post them last night, but my camera batteries died and I had to wait for them to recharge. The jar on the left includes most (I'm sure there are more hiding somewhere!) of my wired ribbons. The jar on the right includes all of the ribbons that I bought at the Mega Meet. 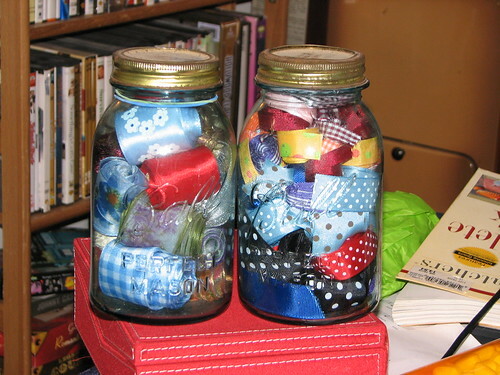 Once I find all of my smaller canning jars out in the garage, I'll be doing this with all of my ribbons and then placing them onto a shelf that a friend has promised to buy for me. Pop on over to Confessions of an Apron Queen to check up on the $50 vintage apron giveaway. There's a consolation prize. Woo Hoo! What a great idea! Your whole blog looks so artsy. I love it. Looking good ... now all that has to happen in someone has to come through with shelves ... oh, yeah, that's me! Off to the Hardware store!